We've been doing exterior painting in Mesa, AZ for over a decade and we will make sure we give your home or business a makeover that will have you and your neighbors saying WOW! You will be amazed at what a new paint job will do for your home. The improved resale value alone can make the exterior painting project worth the investment. In addition, the curb appeal will have you feeling a sense of pride again, much like when you first moved in. The same is true for your business. A new paint job says that you care about your establishment, your staff, and your customers. Give us a call today so we can get together and understand what you are looking for in your next facelift. We will give you an instant free quote and then schedule a time to get started. 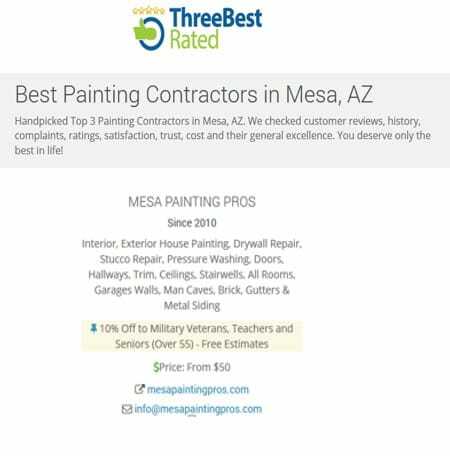 There is a reason we get great reviews and why we have been voted one of the Top 3 exterior painters in Mesa. We would love to add your home to our portfolio of success stories. Exterior Painters You Can Trust! Don't take chances working with anyone but the best when it comes to painting the outside of your home or office. A great exterior job can also extend the life of the shell for a few years. And, we know that the exterior paint job on your home or office is all about curb appeal. A home's exterior paint job tells a story. What is yours saying?